possible abode for life beyond Earth." 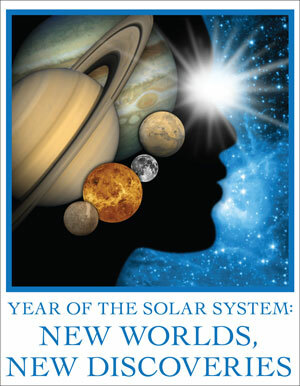 Visit the Year of the Solar System website. Two teams led by GCA scientists Avi M. Mandell and Drake Deming have found faint signatures of water in the atmospheres of five distant planets using NASA's Hubble Space Telescope. The presence of atmospheric water vapor was reported previously for several exoplanets orbiting stars beyond our solar system, but this is the first study to conclusively measure and compare the profiles and intensities of these signatures on multiple worlds. The two teams used Hubble's Wide Field Camera 3 to explore the absorption of light through the atmosphere of each planet in a range of infrared wavelengths where the water signature, if present, would appear. The teams compared the shapes and intensities of the absorption profiles for all five planets, and the consistency of the signatures gave them confidence they saw water. The new Goddard Center for Astrobiology (GCA) exhibit - The Astrobiology Walk - was officially opened on Tuesday, October 29th, with a ribbon cutting ceremony by the Goddard Center Director, Christopher Scolese, and the NASA HQ Astrobiology Program Scientist, Mary Voytek. More than 75 guests attended the event, including HQ and Goddard managers and laboratory chiefs. Images of the opening event can be viewed on the Goddard Flickr Gallery. This event has been rescheduled to October 29th, 2013. The new GCA exhibit - The Astrobiology Walk - describes the search for the origins of life here on Earth, elsewhere in the solar system and throughout the universe. A ribbon-cutting event for NASA officials, special guests and media begins at 2 p.m. EDT on October 29th, 2013 at the Goddard Visitor Center, with scientists who participated in creating the exhibit on hand. The Astrobiology Walk comprises 10 stations arranged in an arc in the Visitor Center's outdoor Rocket Garden. Panels at each station explain scientific principles and describe Goddard's contribution to that science. Each station is also crowned with a three-dimensional tactile iconic object – a visual representation of the science concepts being presented, such as the high-definition topographical globe of Mars and the peanut-shaped nucleus of comet Hartley 2. The exhibit also features stromatolite rocks, formed by blue-green algae, and a banded ironstone formation. These rocks hail from the time of oxygen's first appearance in Earth's atmosphere around 2.4 billion years ago. GCA scientists, Reggie Hudson and Perry Gerakines, have been studying the ultracool chemistry of cosmic ice in GSFC's Cosmic Ice Laboratory. Cosmic ice in deep space is amorphous (unstructured), unlike the ice crystals on Earth. It is so widespread in interstellar space that it could be the most common form of water in the Universe. Often particles and organic compounds are trapped in this ice that could provide clues to life in the Universe. The scientists created ices spiked with an amorphous form of an amino acid (either glycine, alanine or phenylalanine) that is found in proteins, then bombarded the samples with a high-energy proton beam. They found that the amino acids were shielded from the destructive effects of high energy radiation by the ice and could survive tens to hundreds of millions of years if buried at least one centimeter deep in comets, icy moons, or planets. GSFC Press Release on Hartlet-2 - A New Breed of Comet?